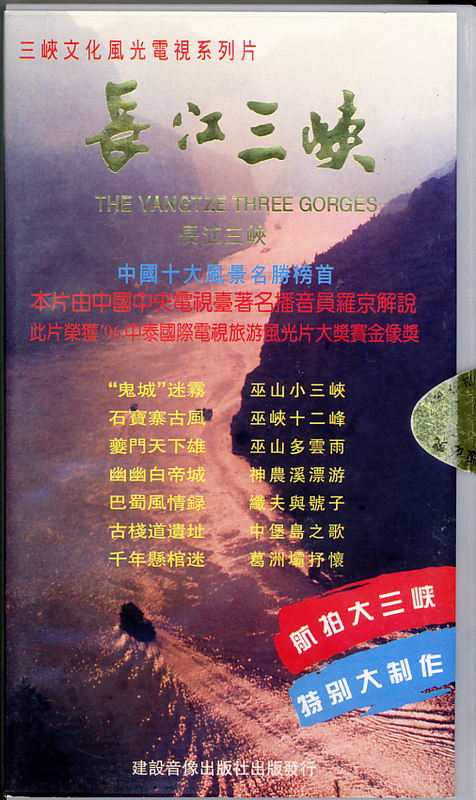 The Yangtze Three Gorges on VHS. Director Unknown. 1997. The Three Gorges of Yangtze River are famous not only for their majestic and overhanging precipices, but also for their secluded beauty. The scenery is so strikingly terrific that attracts numerous Chinese and foreign people. The Three Gorges of Yangtze River epitomize the earth’s most fantastic mountains and scenery. The trip covers 200 kilometer distance. On the way you will behold the various splendors of celebrities on the Three Gorges, enjoying the magnificent scenery of Taishan, the beauty of the fantastic Lushan, the dangerous steppes of Hsuashan, the clouds sea of Hsungshan and graceful beauty of Wuyishan as well. In addition the unique disposition of the boat trackers in the Gorges and Bashan Dance of Tu minority will certainly make you feel relaxed and happy.